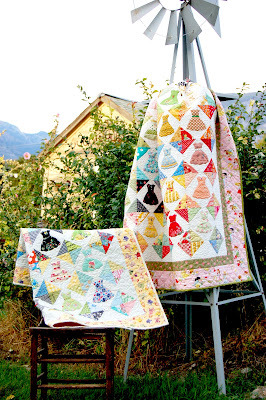 Glenna is calling for feedsack quilts to be posted to help her out with a trunk show for a retreat. 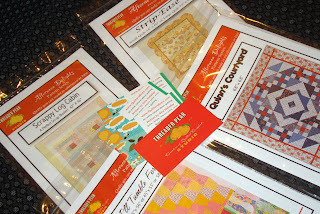 I've been buying feedsacks and patterns from Glenna for years. 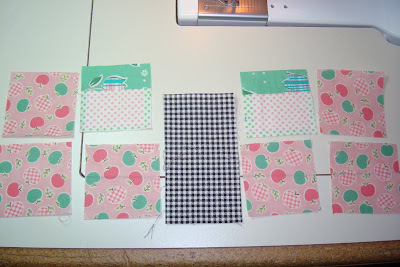 I love Glenna's real feedsack charm squares and I have a small collection. 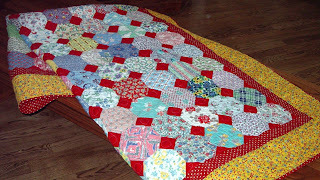 I've shown this quilt before on my blog but its really one of my favorites because of the lovely feedsack variety and the red squares framing each block. They are only snowball blocks but the red really sets off the jumble of colors and patterns and give the eye something to rest on. The machine quilting is amazing. 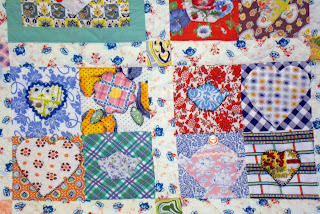 My friend Wren quilted it and most all the blocks have different designs quilted into them. 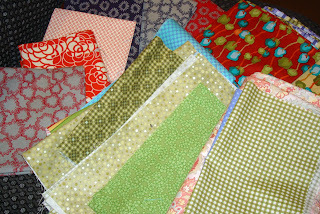 A good manyof these these feedsack squares came either from Glenna and Darlene Zimmerman and some other pieces I picked up along the way. 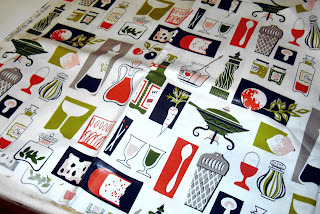 Eileen and I did a personal vintage fabric swap a while back and she gave me some absolutely wonderful pieces. 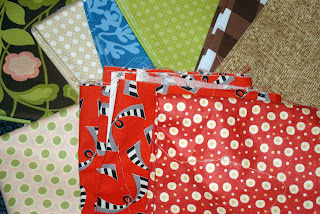 Sarah has been showing some lovely feedsacks on her blog, too. The border fabric is vintage as well. The yellow and red are my favorite color combinations. But don't you love the turquoise in there too? It's got a bit of Monica in there. This is the first feedsack quilt I made. I wanted to use the bubble gum pink from the 40's to border it. But as you can see I learned a lot from this quilt. I learned the value of contrast of light and dark. This quilt is probably 6-7 years old or more from when I pieced it. My daughter Shelbie hand quilted it for me. 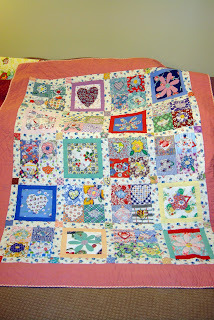 For some of the blocks I used Glenna's flower block (see the cover of her new book), which was in the first pattern I ordered from Glenna way back when. Glenna how old is that pattern? 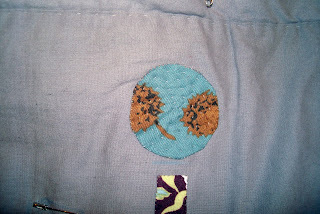 I learned that hand applique and feedsacks do not really go together. 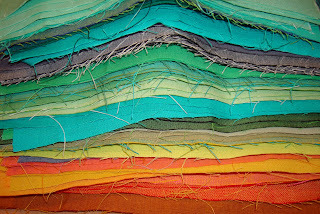 Feedsacks are too loosely woven, of course. 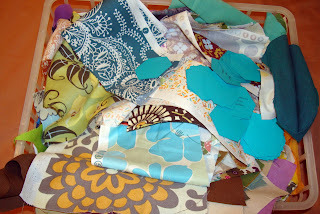 And I learned to use white and more subtle neutrals - a valuable lesson for any quilter. Of course I knew this principal but I guess I needed to relearn it. 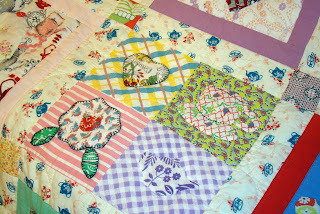 I showed a close up of some of these blocks for Darlene. If she can figure out that in that maze of print some of them are teapots and teacups! 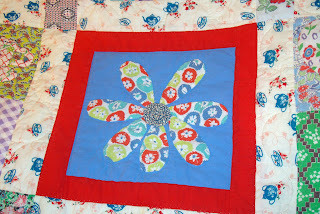 I look at this quilt now and I can see so many ways I could have improved. I really tried to do too much in one project. 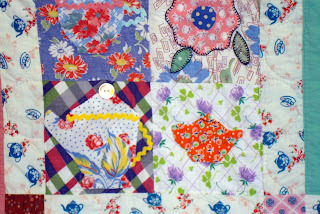 However, to me it is still very sweet because of lovely feedsacks but mostly because Shelbie quilted it for me. It took her a long time. Like I said, I used Glenna's flower for some of the blocks but I sketched the teapots, cups and hearts. It was the first quilt on my road to drawing up my own patterns. So it is an important quilt in my journey. Even with the blurr of colors, I think it still has a lot of charm. Every quilt tells a story. I hope everyone had a fun and productive weekend. 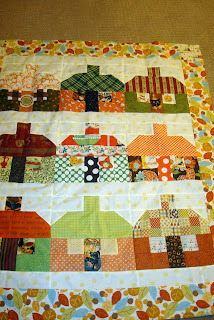 Please don't get sick of seeing cottages because Terri and I will be updating the virtual quilt with the exchange blocks every few days to showed continued progress. Cottages are popping up everywhere and it's really so delightful to see them and see the uniqueness each person in the exchange brings. I hope you can click the picture to see the wonderful details. I've had several people ask to join the exchange since the cut off date and I do appologize that we can't make room for you this time. I do welcome anyone who wants to sew along with us to join by sending photos of your cottages and I will show them on the blog too. They are kind of addicting. 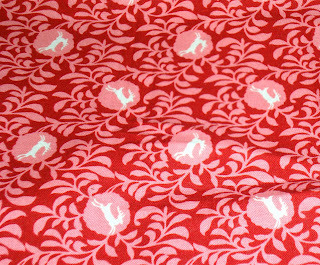 When I was blog hopping and cottage gazing I went to Sarah's blog last week and could not believe her reindeer fabric! Whooohooo. She found a link for me on Ebay to get some, it was on sale, I immediately ordered it, it was delivered Saturday and I have cut out some Christmas Cottage roofs with it. Yeah I copied her, she's amazing. Actually all her fabric is beautiful. Ok I got side tracked. I was going to say that Sarah posted her Christmas cottages and then at the end of the post she mentioned how fun it would be to do Halloween or fall cottages. The idea struck me like lightening and as soon as I had a few moments alone with my machine I dropped everything and started cutting and sewing. Before I knew it I had 9 fall cottages put together. I hope to quilt them in the next couple days just in time for the start of October. It was so much fun pulling out oranges, blacks, deep greens and Halloween novelty. 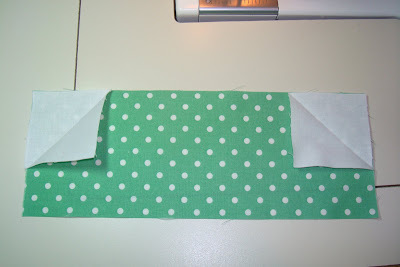 I even used some of Camille's Cotton Blossom fabric. I can't tell you how much fun it was. Saturday was busy. A few of my girls and I briefly popped in to Anna and Erica's quilt show. I'll post a few pictures later in the week. And then we went to Material Girl's quilt shop. 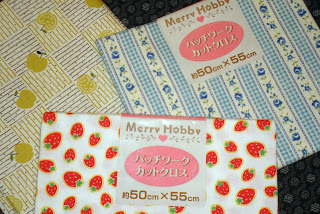 Nadine wasn't there but I did pick up the fabric I won on her blog to make a ironing board cover. That is seriously an amazing shop. More about what else I got there later in the week. 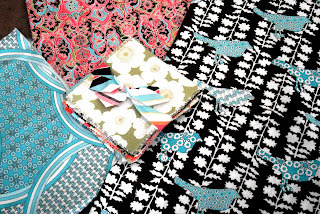 I may not be able to hold out until Fabulous Fabric Friday though. That place makes my heart pound with fabric love. Can't wait to see what you all did over the weekend now. Its been a long process to create these 2 new patterns. It has been fun and I've so appreciated the encouragement I've received. I'm happy with the results and I hope they are clear patterns to read and make. 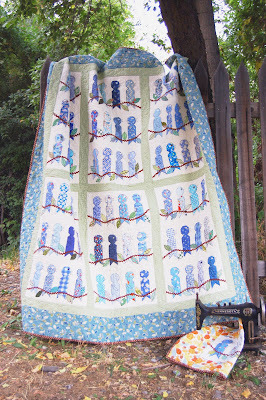 My machine quilter, Wren Woodland (Sew Small Stitches) did such a fabulous job quilting both of them. Kelly McCaleb was my photographer and I am so happy with all the photos. All Dressed Up Quilt Pattern - ready for download or delivery. You can see my side bar or Etsy store. In The Leafy Treetops Pattern - ready for download or delivery. You can see my side bar or Etsy store. The download works like this - I get notification a pattern has been ordered and then I send an email to your email address with the pattern attached as a PDF file to download. I love the concept and creation of making patterns but the marketing end is harder for me. However, I am proud of the patterns. Between the Christmas Cottage Block exchange and getting the final touches on my patterns, as well as other things going on - whew. My google reader is jam packed with posts and my email stacked up. I hope to get back to my normal routine (is there one?) soon. I've missed visiting my blogs and replying to comments like usual. Oh, and if you haven't been contacted yet by email regarding the Christmas Cottage Exchange, or have an issue/correction to make, please email me or Terri (what would I do without her help?). Jamie is turning 18 today but vows to stay a kid forever. 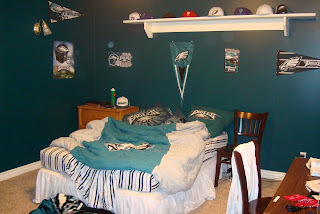 You can tell from the bedroom that Jamie is a sports nut geared mostly towards football and the Philadelphia Eagles. And believe it or not this picture was taken after the room was cleaned. 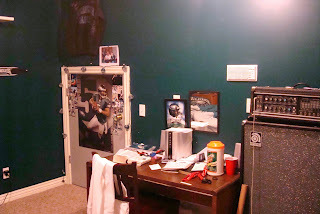 When Jamie and my husband painted the bedroom Eagles green I was not happy. But see who won, not me. 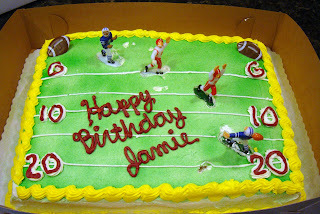 So today there is even a football birthday cake. If you didn't know it you'd think the cake was for a 12 year old boy or something. But Jamie is not only NOT a 12 year old boy . . .
Jamie is a girl, my 6th daughter. 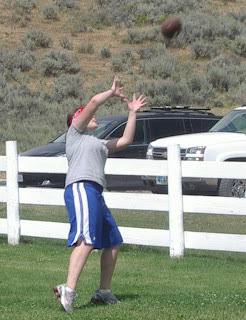 Ever since she was a kid she loved being outside and playing sports. We used to call her Playing James. She made up a song and would sing it for everyone when she was about 6. It was called "I am a kid". Things haven't changed much. 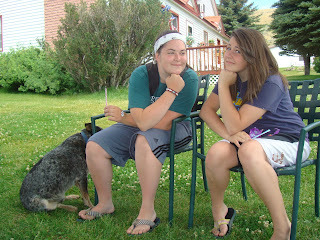 Jamie is on the left and Laurie, her younger sister on the right. They both love sports but Jamie's the family fanatic. See what she's wearing? That's her 24/7 wardrobe. 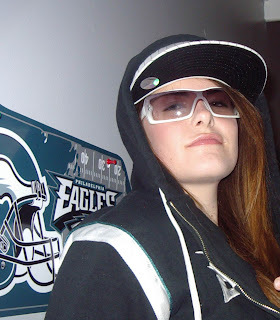 Basketball shorts and Eagles t-shirts. And here is her other persona. Hip Hop Jam Bam. What's a mother to do? This post is mostly for those involved in our Christmas Cottage Block Exchange. I was going to address this in an email to all the participants but since there are several people undecided or those I don't have email addresses from yet, I'm going to discuss the exchange in a post. And I have received lots of questions so hopefully this will help some of you. And to those of you not in our exchange. I promise not to constantly post about this exchange everyday but you may enjoy following along with us as I have enjoyed watching from the side lines in other swaps. First off I'm really excited about the response to the block exchange and very happy to have everyone involved. I don't have final numbers yet but we are a big group. For those on the fence or still wanting to join, you can still sign up until Monday evening. By Tuesday I want to be able to have a final count and email or post groups. There are still some that expressed interest that I don't have email addresses for. I'll post those people a reminder on Tuesday. Over the weekend I've had some time to think and talk to some of our participants about how to carry out this exchange. Since we do have a big group I've decided to post the rules today in the event someone has 2nd thoughts. 1. The finished block size is 10 1/2 x 12. All seams should be 1/4". There will be some natural variation in block size as someone's 1/4" may be more generous than others. And some fabric used may not be fabric you would have necessarily picked out. But that is the nature of the exchange. Making all blocks work together and enjoying the differences we all have is part of a swap. We will have all levels of expertise. Make it work girls. 2. 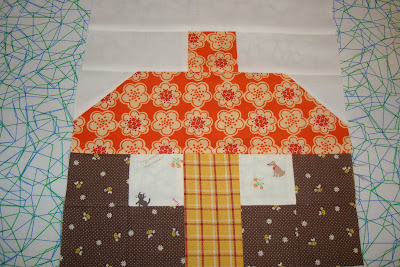 Use my tutorial for constructing the cottage blocks. You can find it here. And on my side bar under tutorials. 3. 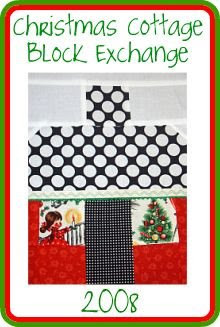 Most of the participants in our exchange will probably make Christmas quilts out of the blocks. So with that in mind, and with Stephanie's helpful suggestions, I will divide the participants into groups of 12 or 16 (depending on our final numbers). That way you will have enough blocks for a quilt and more than enough for table runners, or Christmas gift applications. These blocks are very simple and even those less experienced can make them easily before October 31. 4. These blocks will be scrappy. I'm sure we will get a good mix of color and fabric. I am not limiting colors or dividing groups into colors (after giving that much consideration). However the blocks should all be made from the tutorial and should in some way represent Christmas or winter/holiday season. 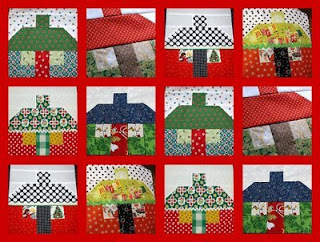 You do not have to use "Christmas fabric" but again, the blocks should go along with our Christmas theme. 5. The light color (white in the tutorial) used around chimney and the top strip of the block does not have to be plain white. Since "white" comes in so many shades I worried about blending all of our blocks with the many shades of white and having it look cohesive. So I've decided to embrace the differences and allow any shade of white or a neutral print that is light in color and not too busy. See my picture above. I think since we are making the blocks scrappy the light or neutral color would go best if there were some intentional variety to it. 6. Fabric should be 100% cotton quilt quality. 7. This exchange is open to bloggers and non-bloggers. I think it will be fun for anyone to participate in as it takes bloggers and readers both to make for a successful blog. And we all have something to offer and learn. 8. Optional * - I expressed an interest in participants using embroidery, a stamp, or some kind of initials or name somewhere on the block so this will become a memory project. You could put an abbreviation of your state or country on the block, anything like that. That is totally up to you if you want to do that or not. 9. The blocks need to be finished and mailed out no later than October 31, 2008. The sooner the better. 10. T from Purple and Paisley has volunteered to help me with sorting the exchange part out with the completed blocks. Some of you will mail your blocks to her and some of you will mail your blocks to me. You'll be contacted on where to send them. We in turn will organize the exchange part and mail them back to you. This gets tricky internationally but I still want to make this opportunity open to everyone so I'll figure out that later. You will mail your blocks along with a packing envelope or manila sized envelope with return postage on the enclosed envelope. I think what you want to do is put the same postage amount on your return envelope as what it costs you to mail it to T or me. Is that part clear? I hope so. 11. 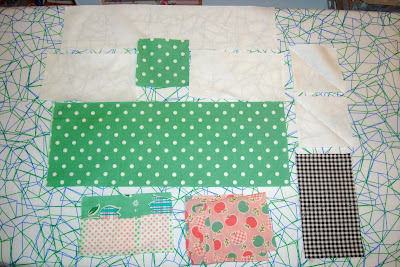 I can think of lots of fun ways to sew the blocks into a quilt. Final projects will be all so different. 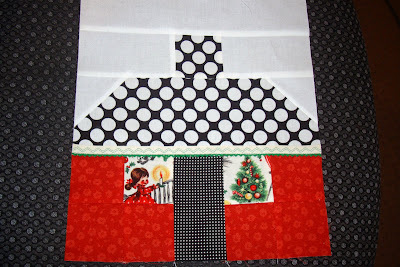 You can sash the blocks so many ways such as with a candy cane fabric or fussy cut snowmen into sashing. I hope to spotlight different ways to put the blocks together during this process. And I hope you will share your ideas with me and the group. 12. 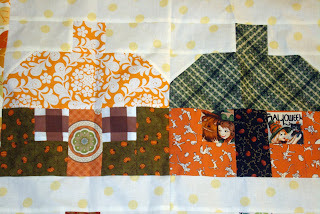 Share your blocks with us on your blog on in pictures to me or to T from Purple and Paisley. T has created a little "mock quilt" montage that will show our different blocks together from time to time to keep us motivated. 13. Not every single block you make has to be identical. The idea is just that everyone gets blocks from everyone in their group. 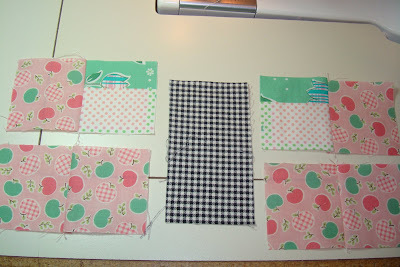 In my picture above I have used several different fabrics since I have fat quarters mostly. So don't think you have to make all of your blocks in exact duplicate. You can use trim for the roof, a button for a door knob, embroidery, or embellishments as you desire. Use your creativity and have fun making the cottages. 14. If you have a blog you can grab the Christmas Cottage button on my side bar that T made for us to show you are participating in our exchange. I'm really excited you want to join our exchange and happy to make new contacts and friends. Expect an email from me sometime Tuesday with more details. And if I haven't covered your questions - please email me. 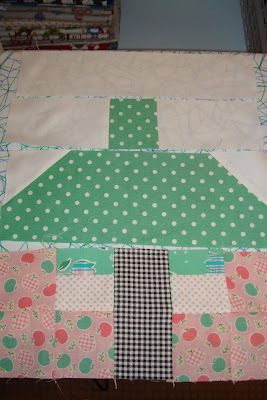 I'm getting excited and ready to start my Christmas Cottage blocks. 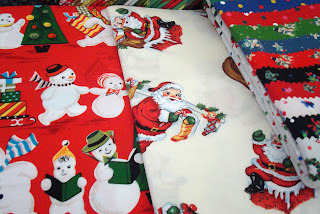 And I got some new Christmas fabric to use. I had a big box of Christmas fabric saved from years past (some vintage stuff too) up in our unfinished room over the garage. We had a really snowy winter last year and ice built up on the roof and long story short - bad leak, icky mess, no more Christmas fabric. I actually don't remember throwing it away but in the thick of cleaning up I'm sure it got tossed out because I can't find it now. Everything was full of wet insulation. I have just a few Christmas pieces from past projects that were with my regular stash so all is not lost. So poor me. 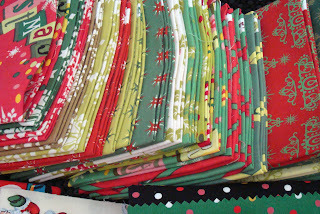 I had to buy these fat quarters of Anna Griffin's new Christmas fabric. There is so much to choose from in this line. I'm going to use some of it for the cottages and some for other projects. I think I'm most excited to get the Mini Muu Christmas from Fat Quarter Shop. You know how I love that Japanese novelty fabric. 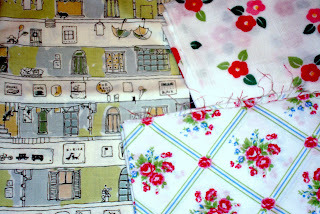 Now ladies in the Christmas Cottage exchange - don't go out and buy new fabric. Go use your Christmas stash. I wish I had mine but that's what happens when you have a mess and you just want to get rid of it. By Tuesday I hope to have a few different Christmas Cottages to show and give some ideas and find out some things from the group. But in the mean time . 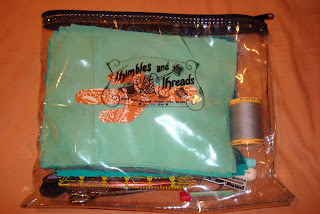 . .
A little bit ago I won a giveaway at Quilter's Buzz. I was so tickled to win. I have so much respect for Gina and I've read her blog for ages. I just love the things Gina sent me. It was like my birthday all over again. Above are some of the fabrics in the box. 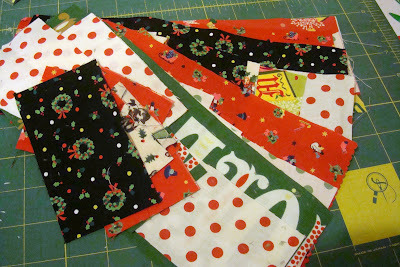 I've already cut a few of the pieces for my Quilt Street houses. This came just at the perfect time. And here is more. The gray and reddish purple on the left as well as some others I've gotta keep an eye on because I saw Natalie greedily petting it and saying "I really like this!" Of course I'll share. Gina also sent me some of the Threaded Pear patterns. There are really some fun ideas there. I've had them on my desk and I've been reading them and dreaming. Yes it's a busy time of year and yes there are lots of exchanges/swaps going on. But still I thought it might be fun to exchange Christmas themed cottage blocks. The idea is still formulating and T at Purple and Paisley has offered to help me with this. Thank you T.
Christmas is still a harsh word before Halloween, I know. However, planning in advance is a essential to a home made Christmas. The size of the exchange depends on how many sign up and how we decide move forward with this. My idea is for each member of the exchange to make a number of the same (or mostly similar) Christmas Cottage blocks. We may end up making groups for this. Then we all send a block in an envelope to each of the exchangers on your list. I can e-mail everyone so we all have email addresses for the members and you can contact them to find out addresses. I'd like the exchange to be open to everyone - blog or no blog and international. I think it would be really great to receive blocks from all over and it would make some fun memories. So anyone can sign up. Just email me and let me know you want to participate by Monday, September 22. I also think it would be fun for each of us to personalize our blocks with initials, blog name, or some identifying sign so we can remember where each block came from. However, that is optional. If you want to participate - great! But no pressure. This should be a fun project. 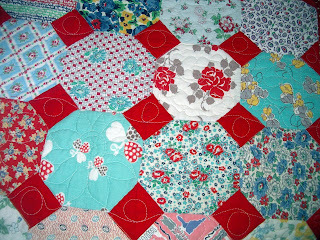 There are lots of ways you could use the blocks, not just for a quilt. You can grab the button above that T from Purple and Paisley made for us if you want to advertise on your blog. But remember you don't have to have a blog to join in the fun. I'm thinking the blocks should be mailed by October 31, 2008 to all the participants to allow enough time to make something with them before Christmas. So keep that time frame in mind before making a commitment. 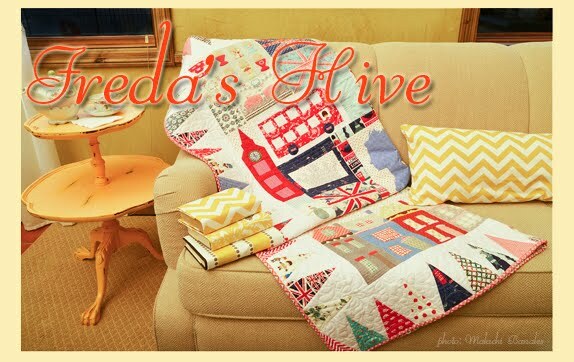 I know Quilt Market is looming but not all of us will be there so its something fun for those like me that stay home (at least for this year). But these blocks are so simple that anyone can make them in a short time. 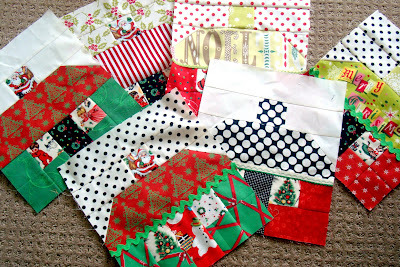 And hey- its a great way to use up Christmas fabric. Speaking of which, you don't have to use traditional Christmas fabric. Anything goes but it should have something about the cottage that says December. Email me with questions and I'll post answers and try to think of things I've missed. I am excited even if just a few of us exchange. I've "met" so many great people and I think this is a great way to solidify good memories and distant friendships. TLC Stitches told me the best way to do this - Thanks Trisha. If everyone sends their blocks to me with a self addressed stamped oversized envelope, then it would save on postage and time rather than having you send them to everyone in the exchange. Any other ideas are more than welcome! Again thanks Trisha. 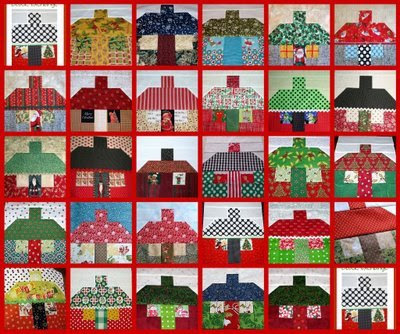 I've been wanting to make a quilt designed around houses for a while now, but I didn't want it to be applique houses or a row of homes made of lots of teeny tiny pieces. 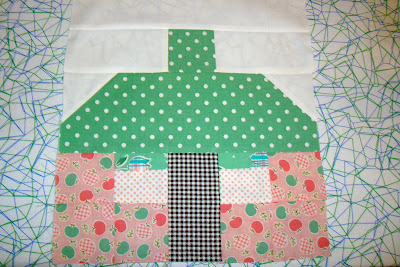 I also wanted the quilt to be simple in structure with the fabric being the focus of the houses. I love working with a basic 2 1/2" square. 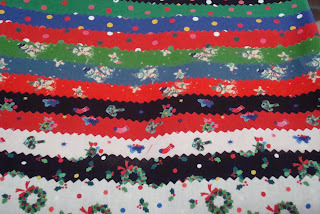 And with jelly rolls being 2 1/2" wide, it is a popular size for basing this quilt and a fabulous way to use up scraps or fat quarters that we ALL have. 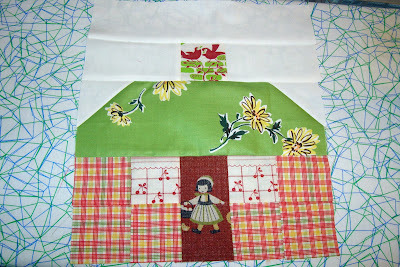 This tutorial is for the "Cottage", just one of the blocks in my Quilt Street pattern. Above is one of the cottages created with simple blocks and fussy cut fabric. This is why I've been dealing with a mess in my cutting area. I pulled out lots of fabrics and looked at them with a different eye on what would be fun to use in creating house blocks. 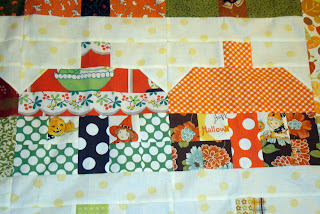 It is really fun to put fabrics together and make the cottages. I can think of lots of applications for the blocks. You could make a bag with a house on the front and back, a table runner, a baby quilt, a mini quilt or a full sized quilt. I hope you'll try out this block and consider the possibilities and uses. 1Roof - 4" x 10 1/2"
1 Door - 2 1/2" x 4 1/2"
2 Windows - 2 1/2" square: Use some imagination here, you could be looking inside the house, at window coverings or just the frame of the window. For the cottage pictured in the tutorial I fussy cut a fabric with 2 different prints and colors (kind of stripe) to create the look of window shades. 2 Chimney side strips - 2 1/2" x 4 1/2"
1 Top strip - 2 1/2" x 10 1/2"
Take the 2 white 2 1/2" squares and iron them crosswise to make a crease as above. 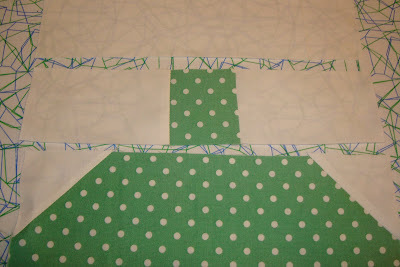 Align the corners of the roof and the white squares together and stitch along the crease line in a basic snow ball block technique. 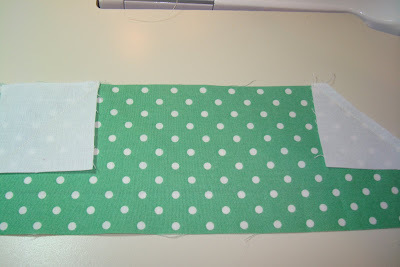 Trim seams to 1/4" And press open with the seams outward. Lay out and set aside the parts of the house so far. 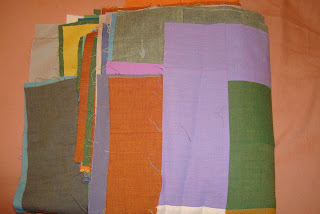 Then lay out your house pieces as above to prepare for sewing. 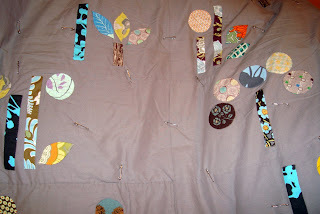 Stitch the squares together as above and press seams. Join the blocks on either side of the door together and then stitch them to the door. Press. Now you can start building the house from the bottom up by attaching the house body to the roof, the roof to the chimney and the chimney to the top white strip. Press and you are done. Finished block size is 10 1/2" x 12" This is such an easy process and you can quickly make several of them in an afternoon. Wasn't that fun? My mom (Nanette) is always after me to post what I am working on. But I am always working on several things at once, a little bit at time, and it takes YEARS to finish something at that pace. I would rather post something I have finished but I am just not a finisher. I am a starter(Nanette is BOTH a prolific finisher and a prolific starter). I like to think up ideas and .... that is usually as far as I go. I have ideas for a quilted calender, an owl quilt, and a few other things that haven't even made it to the fabric cutting stage. 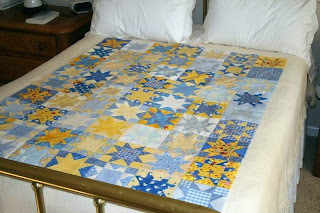 This is a hexagon quilt I have dreams of sewing completely by hand. I've traced close to 500 hexagons (a mere fraction of what is needed for a full size quilt of this type) and .... that is about it. I trace a few hexagons a month and store my bin of fabric and paper hexagons neatly away in my closet. This is my project bag full of thread, scissors, tracing pencils and lots of other notions. You would think that having such a neat bag full of cool tools would motivate me to focus and finish SOMETHING, ANYTHING, but mostly it just encourages me to buy more, neat, cool tools. This is the project I started most recently. 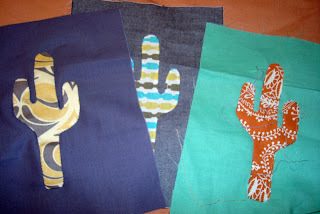 I wanted to make a southwestern quilt inspired by a wet Arizona winter full of rich reds, oranges, pinks, yellows and crazy blues and greens. I had dreams of making a lap quilt for my boyfriend's sister and dad for Christmas. It is just not going to happen. Although this is the project I am most excited about currently, I am only getting three or four blocks done a week. At this rate I am hoping to have something ready for Christmas 2011. Wish me luck! This is the grey quilt I continue to insist on hand quilting. A process I now thouroughly despise. But my vision is clear and I will not stray. I know lots of people were excited to see this finished but I am shooting to show it at Alpine Days next year (11 months away). 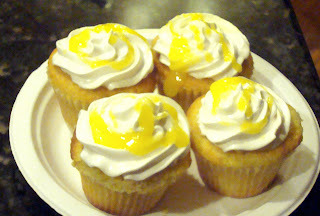 I should be motivated to finish projects by my desire to post on the blog but I can never figure out how to get my pictures to work or my links to post so even that is a chore (I have to have my mom upload everything for me and then I write the text for my pictures! ).